This past weekend, I headed down to our family’s ranch, The Dos Locos, outside of Goliad, Texas for our annual Guy’s Dove Hunting Trip. Although this post does not really contain a recipe, I thought I’d share some pictures anyway (there is a link to the recipe for the Smokey Pork Tenderloin Slider’s that I got from NibbleMeThis. You should really check out his blog.). You may or may not know that I went to Baylor and am a huge fan. 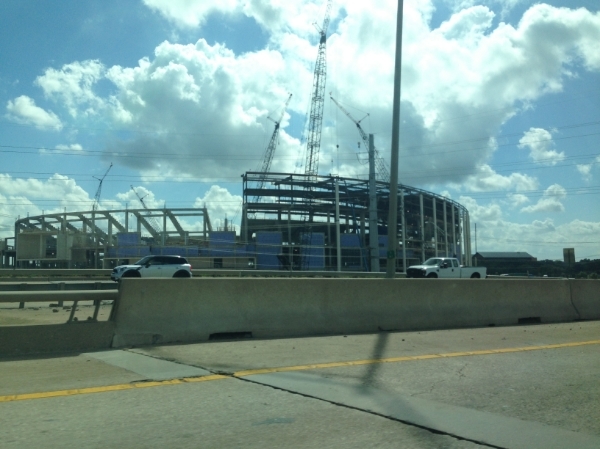 Hard to snap a picture while flying down I-35, but here’s the new stadium they are building right on the Brazos river. It will be sad to see Floyd Casey Stadium go, but its way past time that we got a new one. It should be ready for the 2014 season. After hunting Thursday night (I got 2 dove, they weren’t really flying), it was time to pull out Old Faithful, my offset that retired down to the ranch after getting the Egg. On the menu was just some simple wings. It felt odd using charcoal briquettes. I haven’t used them since…ummm…I guess since the last time I was at the ranch. Felt good to fire the old lady up once again, though. 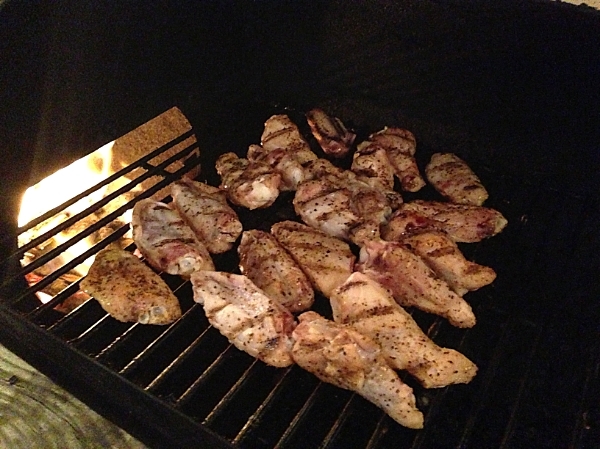 Chicken Wings indirect on the old offset with hickory for a touch of smoke. Maybe it was the ambiance, being down at the ranch all by myself, no distractions, just a cold bourbon and coke in one hand and a book (actually a Kindle) in the other, or maybe I did something right, but these were the best wings I have put out in a long time. It wasn’t the recipe as I did them the way I always do. Just plain ole Buffalo Wings. The skin came out extra crispy, yet they were till moist and tender on the inside. Might sound sacrilegious, but better than any I’ve done on the Egg in a long time. I really don’t have any excuse as to why I forgot to take a final picture. You’ve seen wings before, though, so I’m sure you will forgive me. Regardless, it was a good, quiet first night before everybody was scheduled to come in on Friday. Fast forward to Saturday afternoon. 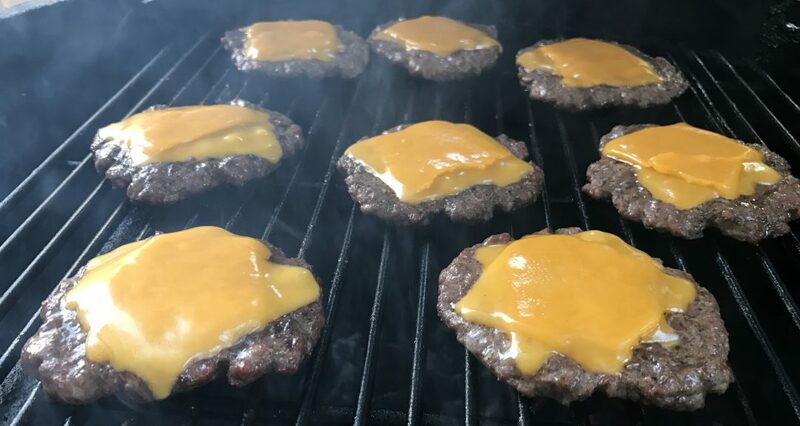 I wanted to cook up something for lunch that would hold us through the evening hunt until we could get back, start a fire and grill steaks for dinner. Awhile back, I saw Chris of NibbleMeThis do some Smokey Pork Tenderloin Sliders on his blog and I knew it would be perfect (check out his blog for the full recipe). 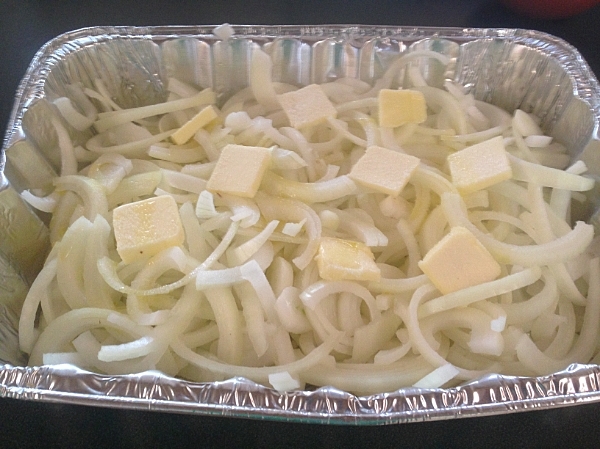 I started off with 4 yellow onions (he used Vidalia, but I couldn’t find them), sliced thin for carmelized onions. He did his on the grill and I was planning to as well, but at the last minute, just did them on the stove. Next up was the tenderloins. I added in an extra step that was not on the original recipe. A quick brine. Bring 2 cups of water to a boil, add in 1/2 cup of salt, 1/8 cup of suagar, 8-10 peppercorns, a tsp or two of the rub you will using, a dash of sriracha and a few by leaves. Stir until the salt and sugar have dissolved. Add two cups of cold water and allow to cool. Place your tenderloins in a gallon Zip-lock bag and pour the brine in. Place in the refrigerator for 2 to 5 hours. 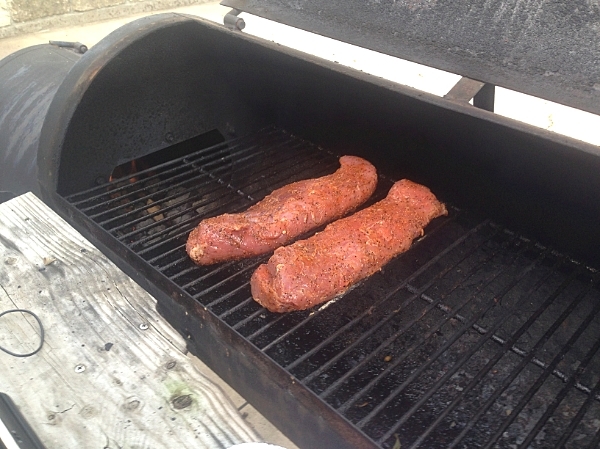 Before smoking the tenderloins, drain the brine and rinse the tenderloins, before adding the rub. I used Salt Lick rub in lieu of what the orifginal recipe called for. Good, but it was a bit peppery. Would probably use a different rub next time. He glazed his with a bacon honey mustard sauce. I was planning on doing that, but there was no honey to be found at the ranch, so mine got a glaze of bacon mustard sauce right at the end. Pulled at 140F. Sliced super thin, as thin as you can get it. Either use a really sharp knife, an electric knife or a kitchen slicer if you have access to one. Slicing up the pork tenderloins. My plate up picture wasn’t the best, because I wasn’t sure I was even going to post anything about it, but at the last minute I figured what the hell. 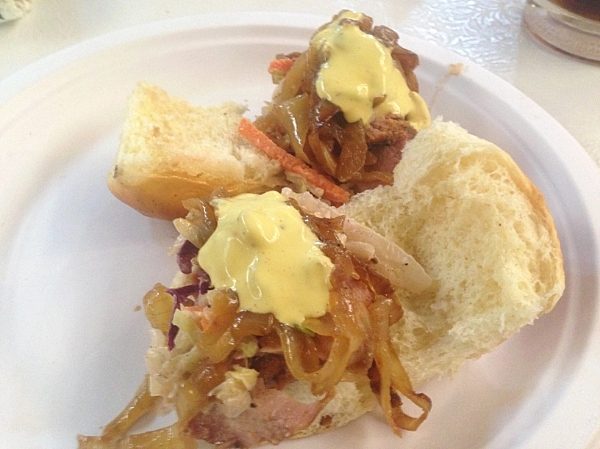 Served up on King’s Hawaiian Roll sliders, pork tenderloin, coleslaw, carmelized onions and bacon mustard sauce. This stuff was the bomb. Off the hook and the chain both. No, seriously…it was really freakin’ good. 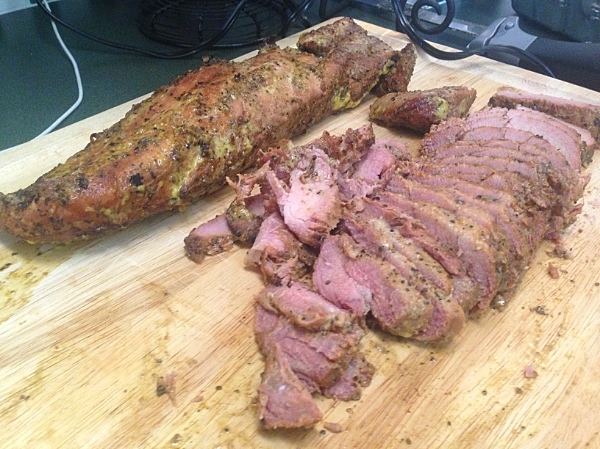 Smokey Pork Tenderloins served up on the finest paper plates. 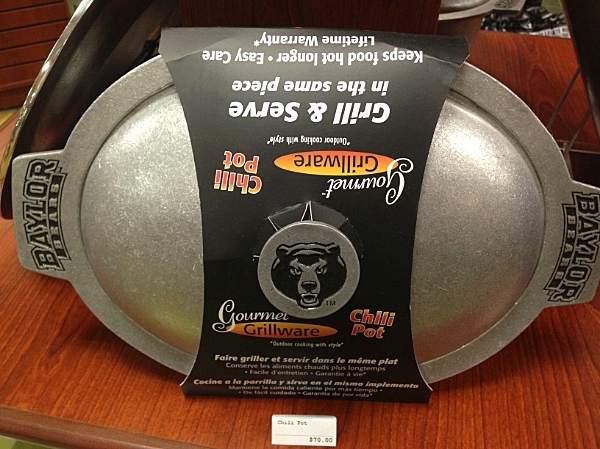 Who wants to do dishes while on a hunting trip? So good, I’ll probably serve it at the next Eggfest I attend. Or tailgate party. Heck, there’s still a bit leftover and I’m having it for lunch today and I’m still excited about it. And just in case you wanted some proof that we did do some hunting, here’s a few I got. Ended up only getting 8 total. 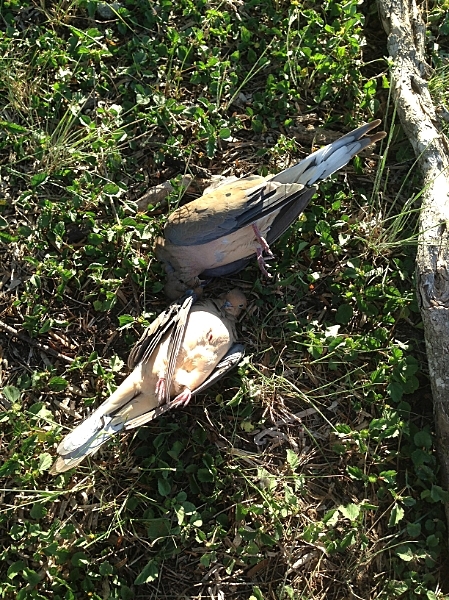 I’m telling you, they really weren’t flying, but I did take my oldest and best friend and saw him shoot his first dove. He was super excited and now I think he is hooked so it was all worth it. That about wraps it up for another successful Annual Guy’s Dove Hunting trip. Two of my haul. Look for them in an upcoming post. I am so glad you liked it. I shared your post on my FB page and my sister said she had already made it twice too. 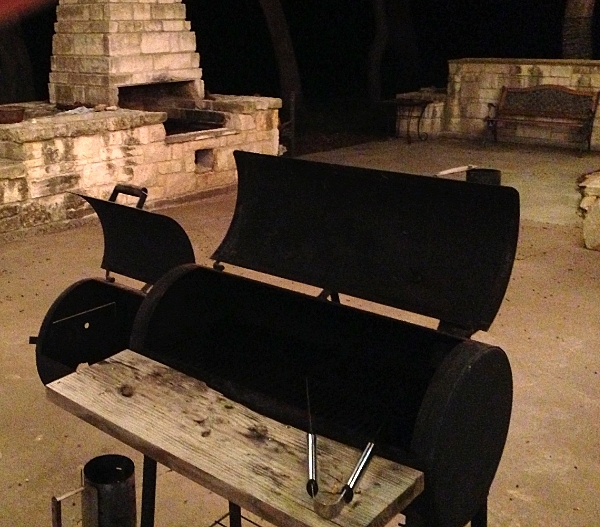 I know you enjoyed breaking out the Brinkmann, your first is always special. I don’t have mine anymore but my friend still has it. I get visitation rights, lol. Thanks for letting me use it. The Brinkman wasn’t my first, but its the oldest one I still have around. It’s nice to light it up every once it awhile when I get the chance. Variety is a nice thing. Has the gotten much traffic on that post today? That tenderloin recipe looks good. I have a Big Green Egg that I’ll have to try that on. Thanks for sharing. Would work great on a Big Green Egg or any kind of grill or smoker. Just make sure to pull it at 140F and let it rest 5-10 minutes so the temp will carry up to 145F.